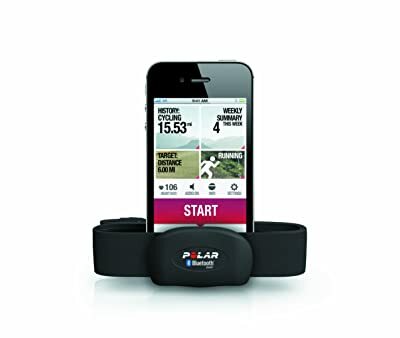 Polar H7 heart rate sensor, provides ECG-accurate readings to compatible receiver whether it is a wrist unit or any bluetooth ready device. Heart rate “monitors” generally consist of a transmitter (heart rate sensor with Chest Strap) and receiver (wrist watch). Actually, the receiver can be anything like watch, smartphones, gym equipment etc. Hence, sensor plays an important role in the whole set of heart rate monitor. H7 is a sensor with Chest strap and you can use your smartphone or other compatible wrist receiver to view your readings. It transmits data in coded form (Polar OwnCode 5khz transmission). This is an important feature as it avoid interference. You can be assured that you are receiving your data only, even in a crowded gym. The chest strap is made of soft fabric and is very comfortable. It come in two sizes M-XXL and XS-S.
Bluetooth: Polar H7 supports bluetooth transmission and is compatible with Bluetooth ready devices. A separate mobile application is required in the bluetooth ready devices (Smartphones) which can receive and display the data. Polar have mobile applications for different devices. One of the application is Polar Beat which is compatible with Iphone and Android devices. It’s a training and exercise application that not only record your workouts but also can plan, train, analyze and share your training results. You can also create an account in Polar Personal Trainer and Polar Beat application will automatically sync your data with the website. So in short, with this device you can use your smartphone (iphone or android) as your display and also sync your data in web. Gymlink: Polar H7 supports Gymlink transmission. So, you can view your data in compatible gym equipments. It is also compatible with other Polar Wrist receivers such as Polar Loop or receivers that come as part of Polar FT1, FT2, FT4, FT7, FT40, FT60, FT80 etc. These models by default comes with Polar H1 sensor, which is very similar to H7 but doesn’t support Bluetooth. So if you have one of the Polar Heart rate monitors and looking for replacing your sensors, H7 could be a great choice. Water Resistance: This works in Water with gymlink compatible devices and not with Bluetooth. So if you have a polar wrist receiver it will work in water and could be a good choice for swimmers. Battery: It has user replaceable battery which is included. For longevity detach sensors from chest strap after every use. H7 heart rate sensor is compatible with most devices. It is low on maintenance. You can use H7 as a stand alone device without the need of a wrist watch. You can view your data in your smartphone. As a sensor, this is a great choice and our top recommendation. Is Polar H7 Heart rate sensor able to do pairing Suunto Ambit 3 run. ?